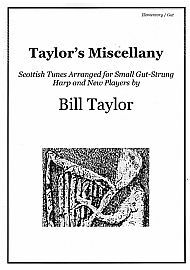 Taylor's Miscellany is aimed at new players with small gut-strung harps of about 2-1/2 octaves. Fingerings, placement brackets and ornamentation are given in this progressive introduction to Scottish music on the harp. Airs, lullabies, marches, jigs, and reels from a variety of sources are included along with recent compositions. £12, available from Marsharp Music. Study recordings are also available.